Though still exhibiting the same fine and thoughtful attention to design, materials, and construction as the first Claudio Albieri bags we received, this four-pipe Italian Leather bag offers it all in a much more compact and portable package. 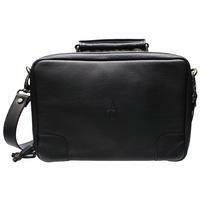 It features spaces for four different pipes, each once again stowed in their own integrated, soft leather pipe sleeves. 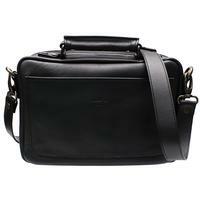 Along with those pipe holsters, you'll also find compartments for tobacco, tampers, and other pipe accessories within the bag as well — in addition to an external pocket along one of the bag's outside faces. 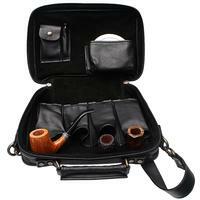 It's the perfect accessory for a pipe smoker on the go — particularly one wishing to travel in style. Available in either a black/red, black/grey, or the solid black you see here.